Home accessories are such a great project to crochet. In this video tutorial I will show you how to make the Hygge Color Block Crochet Baskets, a FREE pattern from Red Heart. Crochet baskets are a wonderful project to make for your own home as a project basket, as a wedding or house warming gift, a special gift for your kids teachers or as a way to organize your desk or room. 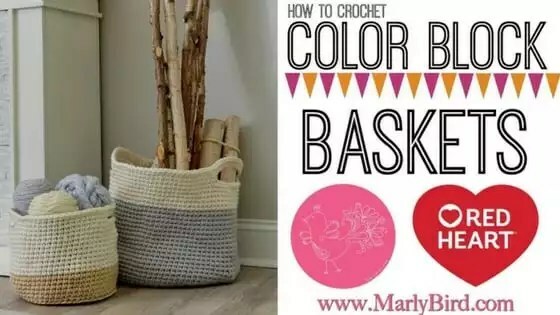 The baskets in this tutorial are color block baskets. This means that there are contrasting panels of solid colors. This video tutorial will show you how to make these baskets as well as how to do color changes, read your pattern, and the crab stitch finish. One of the biggest differences from this pattern to what you may be used to is that you will be holding three strands of yarn together at the same time. Holding multiple strands of yarn together can be a bit of a challenge until you have practiced for a little while. Using multiple strands together can sometimes change the way that you crochet. Sometimes you will need to change the way that you hold your hook to avoid cramps in your hand. You may also need to take brakes more often then your normally would. It can also alter you gauge so it is important to check. To make the hugge mini candy basket like I make in the video, click here. Mostly we think that gauge is only necessary when making something that we would wear, like a sweater. That is true but we should always do a gauge swatch. There is so much that you can learn by doing a gauge swatch. In this case we want to know how our fabric will be when finished. Since this is an item that is made to hold thing we want to make sure that there aren’t any holes in the fabric. If your hook is too large for the project your fabric will be loose and might allow things to fall through. If your hook is too small you will feel the cramping much faster. Try to hit that sweet spot that the designer has found when making the sample. We will need a solid fabric for this project. RED HEART Classic®: Small: 3 skeins each of 334 Tan A and 111 Eggshell B Large: 6 skeins 412 Silver A, and 3 skeins 111 Eggshell B. In the video Marly used Red Heart With Love in the demonstration.